Find Lake Norman, NC Homes for sale. View Photos, Maps and MLS Data Now! Pinnacle Shores - Deeded boat slip avail w/ annual fee. MLS#3498237. Southeastern Realty 1. • Beautiful and immaculate two-story, move-in ready brick home in The Peninsula• Professionally landscaped; irrigation system• Open concept design with lots of natural light throughout• Master bedroom on main; 3 large bedrooms and bonus room on upper level• Top-of-the-line gourmet kitchen; granite countertops and stainless steel appliances• Great room with built-in bookcases, gas log fireplace, and 65" Samsung Smart TV• Large Master bathroom with shower, Jacuzzi tub, and separate vanities• Two-car garage with storage; retractable awning on private back deck• Hardwood floors on first floor• Plantation shutters throughout • Lots of closets and storage space• Short walk to Lake Norman; sidewalks throughout the neighborhood • Short distance to the Peninsula Golf and Yacht Clubs and Jetton Park• Easy drive or walk to grocery stores, pharmacies, restaurants and coffee shops• Friendly neighbors MLS#3498194. I Save Realty. Also: 2 zone Lenox HVAC, Pella Doors & Windows, Home Air Filt System, Tankless WH, Plan.Shutters,Hot Wa Dispenser, Rev Osmosis Filtration,Wired for Sound, Much more! ! MLS#3496016. EXP REALTY LLC. Crescent Land and Timber - This home is being sold 'as is". HURRY! ! MLS#3493870. Keller Williams Lake Norman. Sawyers Landing - Home comes with a 30-day buyback guarantee. Terms and conditions apply. MLS#3496898. Opendoor Brokerage LLC. Enjoy the fenced in back yard that backs up to privacy trees. MLS#3498410. EXP REALTY LLC. No HOA Westport Community Amenities require a membership fee. MLS#3495520. West Norman Real Estate. Join The Club at Westport for golf, tennis, swim and fitness. Walk able Community MLS#3497706. Southern Homes of the Carolinas. The Meadows - Located in the Mooresville School District, and just minutes to I-77! MLS#3495802. 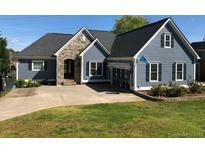 Lake Norman Realty, Inc.
Close to Publix and the Sherrills Ford/Terrell Branch of the Catawba County Library. MLS#3487784. HoneyBee Real Estate LLC. The large yard includes a concrete walkway that leads to the lake with double decker dock boat lift and jet ski pad, 2 large paved driveways with plenty of parking for at least 6 cars, a shed, and lots of plantings of tropical, and flowering shrubs. MLS#3492744. Premier Sotheby's International Realty. The second stairway behind the kitchen leads you to another large bonus room with private bathroom, which could be used as a 5th bedroom. Over sized 3 car garage. MLS#3498047. Lake Norman Realty, Inc.
Carsons Place - Inquire with listing agent regarding boat slip availability. Truly a special find! MLS#3497208. J Cash Real Estate. The Farms - Boat launch just minutes down the road from Hager Creek Boat Launch area to enjoy Lake Norman and all it has to offer! MLS#3493911. Lawrie Lawrence Real Estate. THE COVE AT CHESAPEAKE POINTE - Community has day dock with lake access! MLS#3496717. Keller Williams Lake Norman. This house won’t be on the market long! MLS#3497280. Carolina Realty Solutions. Grand Bay - Just a Short Walk to Your Very Own Boat Slip & Community Boat Ramp is Sure to Please! MLS#3497834. LKNHomes.com Inc.
Isle Of Pines - Low Taxes, Low cost HOA. Don't miss it! MLS#3488397. Southern Homes of the Carolinas. The Gates - Beautiful, level and private backyard with storage shed and an extended patio to enjoy it. Much, much more to see..... MLS#3495568. Lake Norman Shores Realty. Lake Norman Woods - MLS#3497052. Mark Spain Real Estate. Marthas Vineyard - This home is a gem, must see! ! MLS#3495073. Coldwell Banker Residential Brokerage. MEADOW GLEN - You'll enjoy the nice back yard with fire pit. MLS#3497511. Lake Norman Realty, Inc..
West Bay - Lower level basement has guest suite, second kitchen and great room with direct access to pool. MLS#3497190. Trump International Realty. Watertree Landing - Stutts Marina 4.5 MI and Inland Sea Marina 4.4 MI both MLS#3497062. Allen Tate Mooresville/Lake Norman. Grayrock Shoals - Looking for a home that is Move-in Ready, with Water Access and Private then this HOME is indeed 4 YOU! MLS#3491145. Keller Williams Lake Norman.